The hotel has 25 rooms. Hotel Apollo with 24 rooms is situated in a silent street in the centre of Kecskemét. Near to the hotel there are museums, tourist sights, restaurants. The hotel has a closed parking yard, where we can watch your cars. 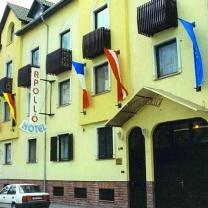 Hotel Apollo can be found behind the courthouse in a silent street in the centre of the town Kecskemét. More attraction can be found near, for example museums, monuments or restaurants, banks. 50 people can have accommodation in 24 rooms. We can accommodate groups. The hotel is located in a quiet neighbourhood therefore it is well graced by businessmen. Our rooms are spacious, they are larger than other hotel's rooms, and they are homely. The rooms are fitted up with TV, phone, bathroom with shower, toilet, 10 rooms are fitted up with air-conditioner and some room has refrigerator. We look after the cleanness of the hotel and arrange the repair of any room. We serve the hot and cold foods on refreshment table. The hotel has a closed parking yard. Air condition in the rooms, using of phone, fax and copy, washing, ironing, café, conference hall with technique equipment. Traditional and modern Hungarian dishes are available. 3-course menu: 1.800 HUFF = 8 EURO per person.